SHANGHAI (Reuters) - A Chinese drugmaker with close military ties is seeking fast-track approval for a drug that it says can cure Ebola, as China joins the race to help treat a deadly outbreak of a disease that has spread from Africa to the United States and Europe. "We believe that we can file to the Chinese Food and Drug Administration (CFDA) before the end of the year," Sihuan's chairman Che Fengsheng said during an investor call last week. "They are looking at this very seriously... and we could get on the 'green light' track," he added. Sihuan's drug is only one contender amongst a number of experimental cures worldwide to treat Ebola, although if successful it would be a huge boon for China's developing pharmaceutical sector and the country's soft power in Africa, an increasingly important partner for the world's No.2 economy. The current outbreak, the worst on record of the disease, has killed more than 4,000 people, mostly in West Africa. Che said one of Sihuan's strengths was its close military ties. The firm, which claims to be China's third largest prescription drugmaker, was originally a military scientific unit, which was spun off into its current form in 2001. "We have a myriad of connections with the military medical science units and have developed lots of products in cooperation with the AMMS," Che said. AMMS is a research unit of the People's Liberation Army, China's armed forces. Che pointed out that a Chinese vaccine against a SARS outbreak a decade ago, also developed by the military, was approved by the drug regulator rapidly after its application, signally that JK-05 could receive similar treatment. "At that time the whole approval process, clinical components and the period after was cut right down," he said. Officials at Sihuan, which is part-owned by Morgan Stanley, were not available for further comment on Tuesday. 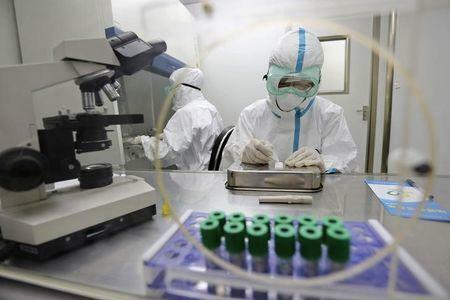 China's Ebola cure bid still lags some way behind U.S.-developed ZMapp and TKM-Ebola, but Sihuan management said the drug has proven effective during animal testing on mice. The drug, which AMMS has been studying and developing already for five years, is similar to Japanese flu drug favipiravir, developed by Fujifilm Holdings Corp, which has been used effectively to treat patients with Ebola. ZMapp and TKM-Ebola have been tested on monkeys, which give a closer immune response to that of humans, and have been used to treat human patients with the disease. JK-05 has not yet undergone clinical trials, but Sihuan management said the firm was actively working towards clinical tests of the drug, which could be shorter than normally required. The drug has also shown promise against diseases such as influenza and yellow fever. Chinese military doctor Wang Hongquan, credited with inventing the drug, said on the investors call that JK-05 would first be used to treat Chinese nationals working in Africa with the disease, but treating non-Chinese would require further international approvals. There are millions of Chinese nationals living in Africa, with around 10,000 in the worst affected countries - Sierra Leone, Guinea and Liberia. JK-05 could also be used if Ebola spreads to China. "We can't rule out the possibility that it will spread to Asia. Particularly in China now we have lots of connections with different international cities and many people coming and going across our borders," he said on the call. Company management and analysts said an Ebola outbreak in China would further speed up the approval process and development of the drug. "It is highly likely the Ebola indication could be approved very quickly if Ebola was to spread to China," said Deutsche Bank analyst Jack Hu in an analyst note on Sunday.